These filo parcels are gently spiced with cardamom, cloves and cinnamon. 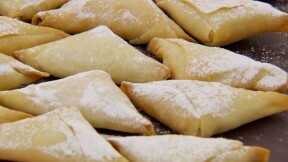 This spiced white chocolate and hazelnut samosa recipe is featured in Season 4, Episode 5. For the filling, pulse the white chocolate and hazelnuts in a food processor until finely chopped. Tip into a bowl and add the cardamom, cloves, cinnamon and chilli powder. Mix well and set aside. Preheat the oven to 350F and line two baking trays with greaseproof paper. For the pastry, cut the filo into strips about 8x2in. Brush one side of the strips lightly with melted butter. Place a teaspoon of the chocolate filling at one end of a pastry strip. Take the corner and fold diagonally, enclosing the filling and forming a triangle. Fold again along the upper crease of the triangle. Keep folding in this way until you reach the end of the strip. Brush the outer surface with more butter. Place on a baking tray and cover with a tea towel while you make the rest of the samosas. Bake the samosas for 6 minutes, then turn them over and bake for another 4 minutes, or until golden-brown. Dust with icing sugar before serving.